A summit of Zard Kuh (‘Yellow Mountain’ in Persian), 3,972m, in the High Zagros, exposing Jurassic and Cretaceous carbonate sediments dipping north-east. Source: Dr. M. Fakhari The quote above from a famed British writer’s travelogue is an expression of mankind’s natural attraction to the majesty and serenity of high mountain landscapes. The Zagros Mountains form an important segment of the Alpine-Himalayan orogenic (‘mountainbuilding’) system that originated from the closure of the Neo-Tethys Ocean and the collision of Africa-Arabia-India continental plates with Eurasia. Studies of Zagros are important for a variety of reasons. Firstly, this active mountain range of colliding continents provides a natural laboratory to investigate how mountains of similar type form. Secondly, the foreland basins of Zagros are home to some of the world’s largest oil and gas reserves, and Zagros outcrops exhibit these subsurface petroleum source-reservoir-cap rocks for direct observations at reservoir scale. Thirdly, the Zagros uplift exerts enormous impacts on the climate, landscape development, ecology, earthquake hazards, and cultural history of south-west Asia. Counter-clockwise plate motion of the Arabian Plate from its position in Gondwana at 200 Ma (Early Jurassic) across the Neo-Tethys Ocean to the Cenozoic collision with the Iranian block (Eurasian Plate) to produce the Zagros Mountains. Le Pichon et al. (1988, Geological Society of America Special Paper 218, p. 111-131), who analysed this plate motion history, estimate about 5,700 km of Neo-Tethys ocean floor subduction (since 190 Ma) and 1,020 km of continental collision between Africa-Arabian and Eurasian plates (since 110 Ma). Source: Rasoul Sorkhabi based on Le Pichon et al., 1988) Location of the Zagros Mountains in the plate tectonic framework of the Middle East. The plateau of Iran is sandwiched by the Zagros on south-west and the Alborz and other ranges to the north and north-east. The northern belt initially formed by the closure of the Paleo-Tethys Ocean during the Triassic-Jurassic (but was reactivated in the Cenozoic). The Zagros belt was produced by the closure of Neo-Tethys. The south-east boundary of Zagros is often considered to be a fault zone in the Strait of Hormuz (the ‘Oman Line’); its north-west boundary, however, is not clearly defined as it merges with several other mountain structures. Geographically, the Urumieh Lake may be considered as the north-west end of Zagros, which then makes this mountain range about 1,500 km in length, but some geologists, on tectonic grounds, extend it some 500 km further north-west to the East Anatolian strike-slip fault - Arabian plate velocities with respect to a fixed Eurasia from Sella et al. (2002, Journal of Geophysical Research, 107,B4: 2081) and Vernant et al. (2004, Geophysical Journal International, 157: 381-398) Source: Satellite image: NASA; Structural map: Rasoul Sorkhabi Anatomy helps us to understand the pathways of evolution, in geology as in biology. Mapping of the Zagros Range over the past century has led geologists to divide these mountains into several tectonic belts which run, for most part, parallel to one another along the north-north-west to south-south-east strike of Zagros. These belts are separated by major, generally north-east dipping, thrusts or reverse faults. Internal structural complexity in each tectonic zone definitely exists and detailed examination of many areas remains to be conducted. Nevertheless, the following description drawn on from the works of Jovan Stocklin, Norman L. Falcon, Manuel Berberian, and Mehdi Alavi offers a simplified framework of Zagros, useful for understanding its geologic history and architecture. The Urumieh-Dokhtar magmatic belt (50-80 km wide) lies to the north-east of Zagros and is composed of plutonic and volcanic rocks which largely formed from the subduction of Neo-Tethys oceanic floor beneath the Central Iran block. Magmatic activity began in the Middle Cretaceous and climaxed in the Eocene (50-35 Ma) but it has continued sporadically to the present day. In places, these igneous bodies are thrust north-eastward over the Central Iranian Plateau. The south-western boundary of the Urumieh-Dokhtar belt, mapped as a thrust zone, is considered by some geologists to be the ‘suture zone’ (continental plate boundary) between the Arabian and Asian plates. The Sanandaj-Sirjan belt, named after the two towns to the northwest and south-east respectively, is a highly-deformed and relatively wide (about 150 km) zone which consists of overthrust Paleozoic and Mesozoic sediments (mostly deformed and metamorphosed), and volcanic and granitic rocks. The tectonic origin of this belt is related to the closing of Neo-Tethys. The High Zagros or Zagros Imbricated Zone is a topographic high and a relatively narrow zone (up to 80 km) of imbricated thrust faults. This zone is bounded on the north-east by the Main Zagros Thrust (or Main Zagros Reverse Fault, initially called “Zagros Crush Zone”), which many geologists have regarded as the Arabia-Asia suture zone because its hangingwall are the Cretaceous-age ophiolites (ocean-floor volcanic rocks) and deep ocean sediments of Neo-Tethys. There is apparently little seismic activity assignable to this thrust zone today. However, the north-western strands of the structure, mapped as the Main Recent Fault, show right-lateral strike movements of up to 200 km. The High Zagros is thrust over the Simply Folded Belt along the High Zagros Thrust, which is exposed to the surface. The Simply Folded Belt (also called the Zagros Folded Belt), at up to 300 km the widest zone of Zagros, is dominated by numerous large ‘whale-back’ and small anticlines as well as localised thrust faults which trend NNW-SSE parallel to the general strike of Zagros. These anticlines are renowned for their petroleum accumulations. The folding mainly occurred during Late Miocene and Early Pliocene times. This belt has also been affected by highly active, north-south trending wrench faults (strike-slip faults across the zone), the largest of which is the Kazerun Fault. The Simply Folded zone is divided into two arc-shaped areas or salients, the Lurestan (or Posht Kuh) arc to the north-east and the much larger Fars arc to the south-west. The Mountain Frontal Fault (Flexure) marks the southwest boundary of the Simply Folded Belt. Associated with the Simply Folded Belt, there are two particular blocks, the Kirkuk embayment to the north-west and the Dezful embayment to the southeast, which deserve special attention because they contain a large number of oil fields. Although these embayments or promontories have anticlines and thrust structures like the Lurestan and Fars salients, they have experienced much less uplift and erosion. Bounded by active strike-slip faults, they appear as re-entrants in front of the Simply Folded Zagros, and their origin is a matter of debate among geologists studying Zagros. The Zagros Deformation Front (also called the Zagros Foredeep Fault) separates the Zagros orogenic belt from the foredeep basins of the Mesopotamia-Persian Gulf which currently receive enormous amounts of sediments from Zagros as well as from the Taurus Mountains in southern Turkey. As in many other fold-and-thrust belts, the faults that have sculptured the Zagros Mountains are joined at depth to a basal docollement (detachment) fault. In the case of Zagros, this basal decollement is often considered to be the ductile (low-friction) layer of Hormuz Salt at the base of the Phanerozoic sediments. The uniform features and parallelism of anticlines in the Simply Folded Belt indicates such a common detachment horizon at depth. This notion suggests a ‘thin-skinned’ tectonic style in which the deformed sedimentary cover is detached from the underlying Precambrian basement. While this appears to be the case especially in the Simply Folded Belt, it is conceivable that basement faulting in the High Zagros and beyond has also taken place at deeper levels but that these structures have not emerged to the surface. This is supported by the distribution of earthquake hypocentres. Moreover, the areal extent of the Hormuz salt in the entire Zagros region is not well known; it is possibly absent or insignificant in the north-western parts of Zagros. Structural map of Zagros (between latitudes 38° N and 26° N) showing the major tectono-stratigraphic zones and bounding faults. Zone A: The Urmieh-Dokhtar magatic arc; Zone B: Sanandaj-Sirjan belt; MZT: Main Zagros Thrust (Reverse Fault); MRF: Main Recent Fault. Zone C: High Zagros ‘Imbricated Zone’; HZT: High Zagros Thrust. Zone D: Simply Folded Belt. MFF: Mountain Front Fault (Flexure). Kh.F: Khanaqin Fault. Br.F. : Bala Rud fault. H.F.: Hendijan Fault. K.F. : Kazerun Fault. ZDF: Zagros Deformation Front (also called Zagros Foredeep Fault). Zone E: Mesopotamian-Persian Gulf foreland basin (Quaternary plains on the Arabian platform). (Modified after Mehdi Alavi, 1994, Tectonophysics, 229, p. 211-238 Manuel Berberian, 1995, Tectonophysics, 241, p. 193-224). Source: Rasoul Sorkhabi Precambrian basement rocks have not been exposed in Zagros and previous suggestions of Proterozoic metamorphic rocks or granite bodies have been refuted by new data. The deepest wells drilled in the Zagros basin have not reached the Proterozoic basement. 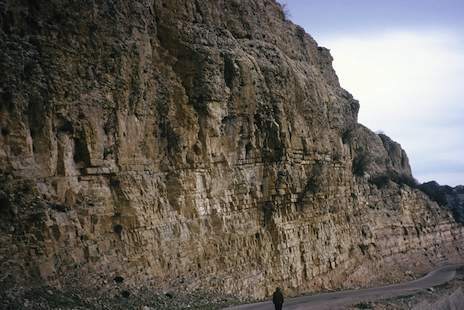 The oldest rocks exposed in the High Zagros are of Lower Cambrian sediments at the base of major thrust zones indicating that these structures have cut through the entire Paleozoic-Mesozoic succession. Besides these, the emergent plugs of the Hormuz Salt, abundantly in the Simply Folded Belt, have brought debris of Infracambrian sediments and metamorphic rocks to the surface. The story of Zagros may be described in five acts of a geologic drama spanning the past 500 million years or so. Act 1, the longest, is the deposition of vast amounts of sediments on the passive-margin, continental shelf and slope of the Tethys Ocean when Arabia was part of the supercontinent of Gondwana in the southern hemisphere. The thickness of these Paleozoic-Mesozoic sediments is 4,000-7,000m. 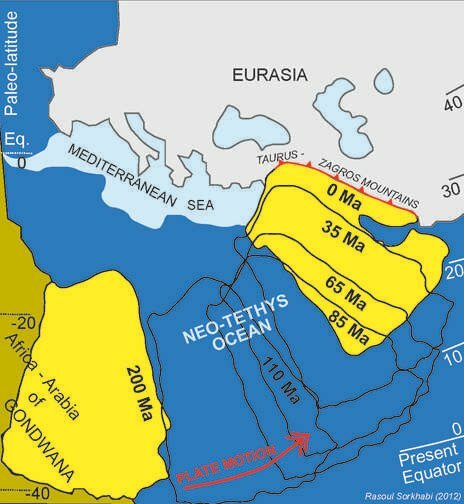 Act II begins in the Middle Jurassic when Africa-Arabia started to split from Gondwana and the Tethys oceanic floor, being denser, began to subduct beneath the Central Iranian continental block. The partial melting of the subducting oceanic slab produced an Andean-type igneous arc on the Iranian block. In the Late Cretaceous, compressional stresses produced the first deformation in Zagros, notably in the obduction (overthrusting) of ocean-floor slivers onto the marine sediments. Act III is the head-on continental collision between Arabia and Central Iran, pushing the ophiolites further south-west. 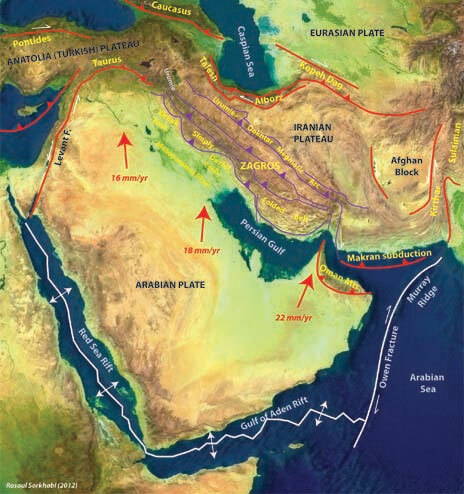 Geologists have no consensus on the age of the Arabia-Asia collision partly because of the scarcity of data (especially paleomagneticgeochronlogic data from key areas) and partly because of different concepts of ‘continental collision’ for a geologically complex region. Suggestions for the timing of the collision range from latest Cretaceous to the Miocene. This event likely took place (or was completed) at the end of the Eocene, after which both the subduction-related igneous activity and the plate motion of Arabia substantially decreased and there is a widespread Oligocene unconformity in Zagros. It is notable that shallow marine sedimentation (notably the Asmari limestone) continued even after the continental collision, just as it is still continuing in the Persian Gulf. Act IV is the rise of the Zagros Mountains by compressional stresses and crustal shortening and the south-westward sequential development of major thrust structures. 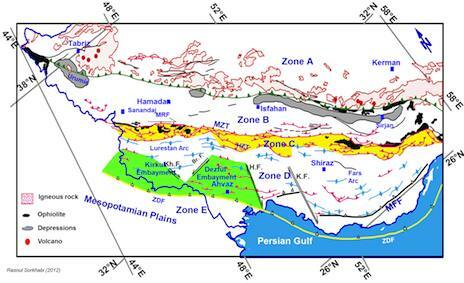 Quantitative studies of the spatial and temporal development of the Zagros structures in various transects and by integrating geophysical and well data and detailed structural-stratigraphic mapping are critical for better evaluation of the subsurface petroleum systems in the Zagros basin. Since the Miocene the rifting of the Red Sea and the Gulf of Aden and the subsequent separation of Arabia from Africa have supplied renewed stress for tectonic deformation in Zagros. Recent studies have also postulated the ‘slab break-off’ of the subducted Neo-Tethys ocean floor beneath the Central Iran block after the continental collision. This break-off, is considered to have served as a force for an orogen-scale ‘thermal uplift’ of Zagros in the Neogene, and also as a heat source for the continued volcanic activity in the Urumieh-Dokhtar belt. Act V (coeval with Act IV) involves the development of a long, wide foreland basin in front of the rising Zagros and the in-filling of this basin with sediments carried by rivers from these mountains. The ‘antecedent’ pattern of river drainage in Zagros is a remarkable feature. Many (but not all) rivers were already established before new mountains (mainly anticlines) popped up; therefore, the streams continued their flow and valley incision simultaneously with tectonic uplift of mountains. In his classic work The Zagros Streams (1965), Theodore Oberlander has documented this cooperation of erosion and uplift to produce spectacular sceneries in Zagros. A fabulous Landsat image (taken on 2 February 2002) of large ‘whale-back’ shaped anticlines in the Simplyfolded Zagros. Such anticlines, home to enormous oil and gas reserves, are large folds produced by Hormuz Salt movement at the base and compressional stresses of the Arabia-Asian collision. 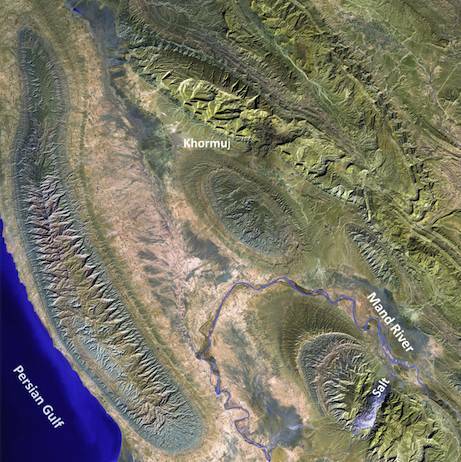 The town of Khormuj (with a population of about 35,000) and the Mand River (both in the Province of Bushehr, Iran are visible in the figure. A salt dome has intruded through the crest of the anticline. Source: NASA The reasons why the Zagros basin and the Arabian platform are so prolific for oil and gas have been discussed in a previous article in Geo Expro (Vol. 7, No. 1). Suffice it to mention a few points in relation to the Zagros tectonics. It is important to note that the Zagros foreland basin did not develop on a Precambrian basement (as it happened in the central parts of the Himalayas) but was superimposed on the shelf and slope sediments of Tethys. The thickness of Cenozoic sediments in Zagros is 3,000-5,000m. The overburden of these sediments as well as the thickening of the basin by fold-thrusting deepened the organic-rich Mesozoic source rocks to the oil and gas generation window. Moreover, the upper parts of the Zagros foreland sediments are extensive evaporites (Gachsaran Formation) which provide an excellent regional cap rock for petroleum accumulation. Finally, the Zagros tectonic stresses have not only produced large anticlinal and thrust-fault traps for oil and gas pools but also contributed to the fracturing of carbonate reservoirs which dominate this region. An outcrop of the fractured Asmari limestone (Early Miocene) in south-west Zagros; this is a major carbonate reservoir in the Zagros foreland basin. Source: S. Tabrizi The average altitude of Zagros in its northern and central parts is 2 to 2.5 km while in the south-east it is 1.5 km. 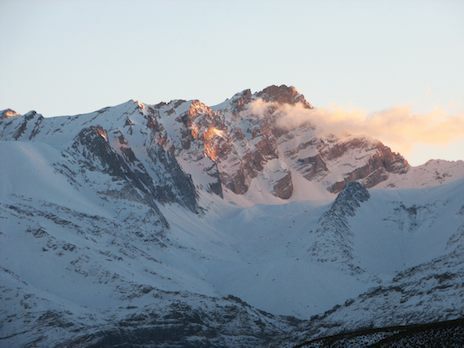 Some of the highest summits in Zagros are Zard Kuh (4,548m), Mt. Dena (4,359m), and Oshtran Kuh (4,140m). The Zagros uplift has produced a lofty barrier in south-west Iran against the rainbearing air currents from the Mediterranean and the Atlantis, thus producing rain shadow and a dry desert climate on the Iranian plateau, but a zone of high precipitation in the foreland. Precipitation is usually higher in the northern and central parts of Zagros, between 300 and 1,200 mm a year, but is reduced to 100-500 mm a year in the southern parts close to the Persian Gulf. Large rivers originating in the Zagros Mountains supply freshwater in that region. These rivers and streams have also created alluvial plains on which some of the earliest agricultural communities appeared some 10,000 years ago (shortly after the last glacial age). The majority of the Zagros rivers flow into the Persian Gulf, such as the Karun River (the longest) which passes through the city of Abadan (where the first refinery in the Middle East was built in 1909-1913). But some rivers drain the interior areas behind the High Zagros; for example, the Zayandeh River which flows through the famed city of Isfahan. Seasonal climate and pastures of Zagros have also motivated nomadic life, most notably of the Bakhtiari tribes about which Vita Sackville-West wrote in her 1928 travelogue. In 1996, Patrick McGovern of the University of Pennsylvania Museum published chemical analysis of wine stains from 7,000-year old jars found from a mud-brick building in Haji Firuz Tappe (near Lake Urumie) in northern Zagros. This is the oldest inery on record, and it comes from a region where grape grew in the wild. The story of Zagros has not come to an end. Numerous earthquakes are a (sometime tragic) testimony to the tectonic activity of the Zagros area. GPS measurements of a large network of geodetic benchmarks published in the recent decade indicate that structural shortening and strike-slip motions are taking place at rates up to 10mm/yr in Zagros; these data indicate that almost one-third of the convergence of the Arabian plate (about 2-3 cm a year) is deforming Zagros, the rest of convergence being taken up by the other parts of Iran. Technological imaging advances and a phased development in the 15 years since discovery have begun to unlock the full potential of the Mad Dog Field, increasing its known oil-in-place nearly tenfold to up to four billion barrels of oil equivalent.